Red Blooms – When you need a small tree that will grow especially well in hot, dry locations the Arapaho Crape Myrtle is what you need. This tree is extremely valuable for southern gardeners and wherever a drought-resistant large shrub or small tree is needed. 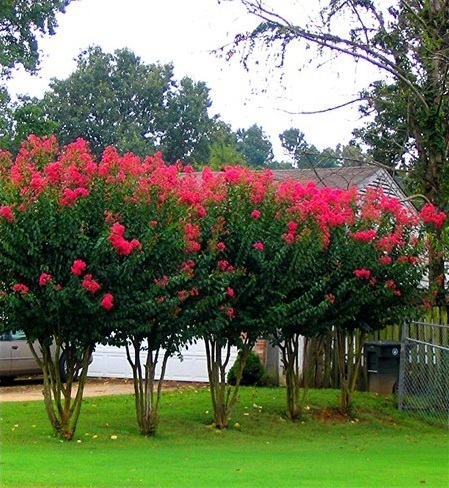 It will grow in a wide variety of soils and is especially resistant to powdery mildew which disfigures so many older varieties of Crape Myrtle. 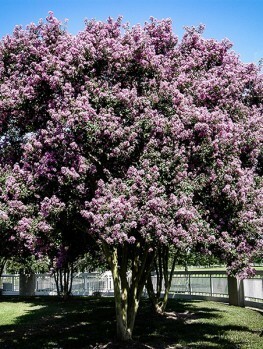 The Arapaho Crape Myrtle is a small tree that will reach 20 feet tall and 10 feet wide in around 15 years. It has beautiful red flowers in large clusters at the ends of the branches and flowers continuously throughout the summer and well into the fall. If you live in a hot, dry part of the country you already know how hard it is to find plants that will do well in your garden without a lot of attention and watering. A tree that will actually thrive in those conditions and bring a great display of summer flowers to your garden would be a gift you wouldn’t refuse. The Arapaho Crape Myrtle is that gift. This tree has been especially produced by plant breeders at the National Arboretum to combine great flower color with disease resistance and the ability to thrive in the hottest and driest locations. Crape Myrtles have been a fixture in southern gardens for 200 years but they have their problems. Most of the older varieties are lavender or pink in color, which can become monotonous. They emerge in spring with lots of promise and clean, glossy leaves, but just as the flowers are coming the leaves become covered with a white film that seriously detracts from their potential beauty. This is a fungus called powdery mildew and is a common problem with these trees. For quite a long time plant breeders have been trying to develop plants that will not suffer from this problem. 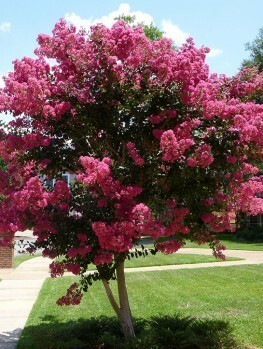 The Arapaho Crape Myrtle is a product of that breeding and is very resistant to this nasty disease. It’s a fast-growing tree to 20 feet and even when young it will be covered all summer in huge clusters of bright red flowers. It makes a lovely specimen tree and it also is a terrific choice for a privacy screen or for planting along a hedge or driveway. It can be pruned as a single-stem tree or left to grow into a multi-stem large shrub. 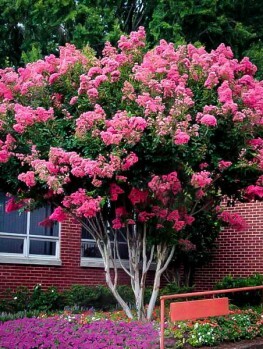 The Arapaho Crape Myrtle grows one or two feet a year until it reaches 20 feet. Young growth and the growth after pruning can easily be 3 to 5 feet a year, so this plant will rapidly fill out and make an excellent small tree for any garden. It is so happy in dry soil that you should be careful not to plant it in a damp or low-lying part of your garden as it will suffer and do badly. Right out in the sun is where your Arapaho Crape Myrtle will do best and that is where it should be planted. 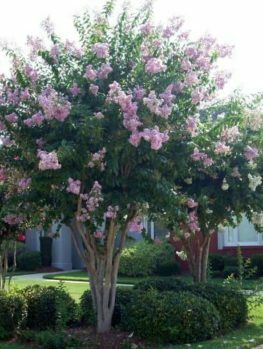 This tree has very few pests and the only important disease of Crape Myrtles is mildew which this plant has been bred to be especially resistant to. It is also normally not eaten by deer so it can be planted in rural areas where deer will devour many other plants you try to grow. It will grow in all kinds of soil but does well in heavier clay soils and in open, dry, sunny positions. Choose a sunny location for your tree and allow enough room for it to develop. When planting make sure not to cover the roots with too much soil, so plant it at the same depth as it was in the pot. Dig a hole that is two or three times wider than the pot, but not any deeper and add some organic material to kick-start growth. Once your tree is established, cut back the branches in late winter to the point where they are ½ to ¾ of an inch thick but no thicker. This will encourage strong shoots with large flower heads. Remove the flower heads as they fade to keep new ones coming right up to the first frost. 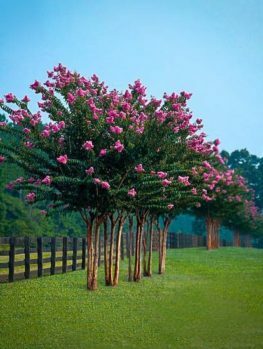 Crape Myrtles grow naturally in China and Korea and they were brought to America a long time ago. The first trees were planted in Charleston at the end of the 18th century and they thrived in the warm conditions there. They have become associated with summers in the South but they can in fact be grown across all the warmer parts of the country, in zones 7, 8 and 9. 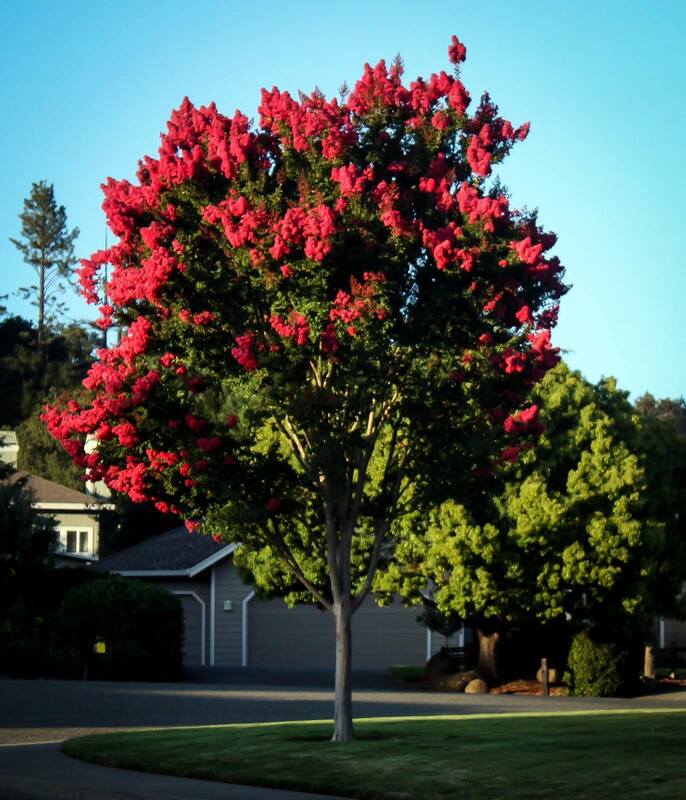 The Arapaho Crape Myrtle can also be grown in zone 6, so gardeners in those regions can now enjoy this wonderful summer plant. In zone 6 the branches will die back close to the ground, but new growth will come from the roots and reach 3 to 6 feet in a season. Since Crape Myrtles flower at the ends of new shoots produced each spring, these plants will bloom just as prolifically when grown this way as they do on larger trees. So in cooler areas this is a great way to add summer color to your garden without having to keep planting annual flowers every year. The Arapaho Crape Myrtle is the product of a complex breeding program at the National Arboretum, in Washington D.C. Breeder took three species of Crape Myrtle, the common type, Lagerstroemia indica, and two rarer species, Lagerstroemiafauriei and Lagerstroemia limii and mixed them together to produce a plant that is not only beautiful, with large panicles of double flowers, but highly mildew resistant and especially vigorous in the hottest and driest conditions. It has flowers that are really red, not just dark pink and the glossy leaves are also tinged with red. The bark is smooth and naturally falls off from time to time to reveal beautiful new bark of a pale tan color beneath. 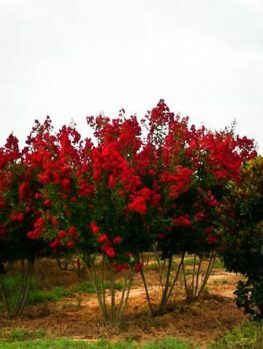 Because of this special breeding program the Arapaho Crape Myrtle can only be reproduced by taking cuttings from properly identified trees of exactly this variety. Our trees are produced in that way and are quite different from trees produced from seed or from older varieties that will not have the qualities of this tree. So avoid cheaper trees that will only be a disappointment to you. Our trees are exactly true to the proper form and type. We are constantly receiving and selling new stock so that our customers receive the best plants possible, so supplies of this tree may be limited. 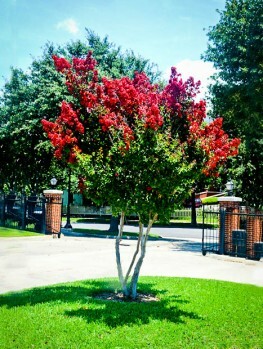 Order your Arapaho Crape Myrtle now to avoid disappointment.